Put all your other projects on hold. Make sure you have a lot of time and a good strong internet connection. Have something to drink and snacks at hand. 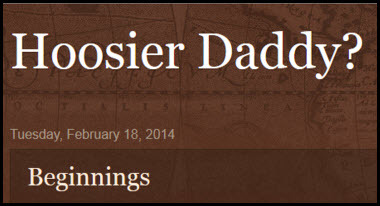 Then click over to Hoosier Daddy?, a blog by Indiana genealogist Michael D. Lacopo. Scroll down on the right hand side, where the links are to the posts in reverse date order. Then read each and every post in this blog, in chronological order, starting with “In the beginning…,” posted back in February, all the way through to “Hoosier Daddy? … Revisited,” posted yesterday. Hoosier Daddy? is the story of the search for Michael’s grandparents. His mother, Carol, was adopted, and when Michael became interested in genealogy he wanted to find out more about her biological family. How he started in 1982 with just a few clues… how he ended up, in 2014, still putting together the pieces of the puzzle. It is a masterful tour de force in genealogical storytelling. And it has everything you might want: suspense, pathos, tears, laughter. A lot on how to do genealogical research. A lot on how not to do it. A skillful interweaving of historical information and the modern hot-on-the-trail research. Detailed and clear explanations of how to actually use DNA in solving family mysteries. And it has the cliffhanger ending. The cliffhanger ending to Every. Blasted. Post. The cliffhanger ending to Every. Blasted. Post. That’s. Driving. Me. Bonkers. Waiting. For. The. Next. Installment. And the story’s not over yet. So when you finish reading yesterday’s installment, do me a favor, okay? Friend Michael D. Lacopo on Facebook. And join me in threatening to duct tape him to his chair until he finishes telling the story. You’re right. It is that good! I’ve been reading it all along and when I see he has posted another “installment” on this epic, I stop everything else and read the latest. It is a very interesting story, very well told. I’m with you Judy… let’s duct tape him down! lol Like most who follow his blog I too put everything else on hold to read his latest entry. I make no apologies but when I read a mystery book I always have to read the last chapter first so I can relax and enjoy the book. Since it’s close to Christmas I guess I should also admit to sneaking into my parents closet to do a little pre-Christmas snooping. OK… parcel opening. It meant I slept well at night and was still excited when Christmas arrived. It wasn’t until mid-life that I told my Mom but she wasn’t sure she believed me, wondering how I had wrapped the gifts back up so she never knew. I didn’t divulge my secret! So HURRY UP MICHAEL… I can’t wait until Christmas you know. Can’t believe there’s another one just like me….my nickname as a kid was “Snoopy”…can you believe that? I’ve been following it from the beginning, too, and every new post comes in at 10:10 PM which means I have to stay up a little later than I planned! I too have been reading this blog since about May. I was so upset when I caught up then started having to wait for the next installment. It is captivating. It goes to show you, anyone’s family history can be interesting when the story is told well. Well, now I have something else to thank the Legal Genealogist for. I for one had did not know about this blog and I wish to thank you very much for keeping me up all night (I mean morning) reading each new installment. Absolutely wonderful. I certainly accept the blame (credit!) for letting you know, Craig! Thanks for sharing this website with your readers. It is, indeed, a wonderful find. Only a few posts in and I’m already totally engaged…and trying to find more time to continue my read of a truly compelling story. Glad to have had the chance to share this! I can’t tell you how late I stayed up to read this womnderful, fascinating story but even this night owl was surprised when I looked at the time. Thank you, Judy, for pointing this out. And I say let’s get that duct tape ready. I LOVE the way he writes! I’m hoping, as I believe many are, that he’ll put these into a book! It’s just kind of, ummm, irritating to have to read backwards through all those posts. But, they are wonderful! I’m hoping eventually he publishes this as a book! Thanks, Judy! I read Michael’s blog in one sitting yesterday. It was a day well wasted!